Nahem Shoa - Giant- Heads-Paintings - Nahem Shoa artist and painter artwork Giant Heads paintings, Skulls paintings, Floods and Disaster paintings and Nuclear Paintings. Nahem Shoa, a contemporary artist and painter was born in 1968 in London, Notting Hill, the city where he stills lives and works. Nahem Shoa's childhood was bohemian as both his parents were artists who had just completed an MA Fine Art, at the Royal College of Art, London. At the age of four he decided to become an artist, inspired by two vivid childhood experiences, eating jelly off the bodies of two naked people in a hip 1972 London Art Happening and watching his father perched on scaffolding being painted, as a spinning fool, onto a three thousand square foot mural by artist Robert Lenkiewicz. A period as a graffiti artist culminated in 1985 in a big hip hop festival in the Riverside Studio's, where he showed his work alongside legendary American Bronx Graffiti artist Lee 163. Nahem Shoa went on to do a B.A degree in Fine Art in Manchester College of Art and a Postgraduate at The Royal Drawing School. Around this time he began to be trained in the classical tradition by the infamous British painter Robert Lenkiewicz. Nahem Shoa painted from life Giant Heads of people from Black and Ethnic backgrounds until 2007. He then turned to other subjects that drew on 'unreal' sources, photograph, TV and film as well as memory. 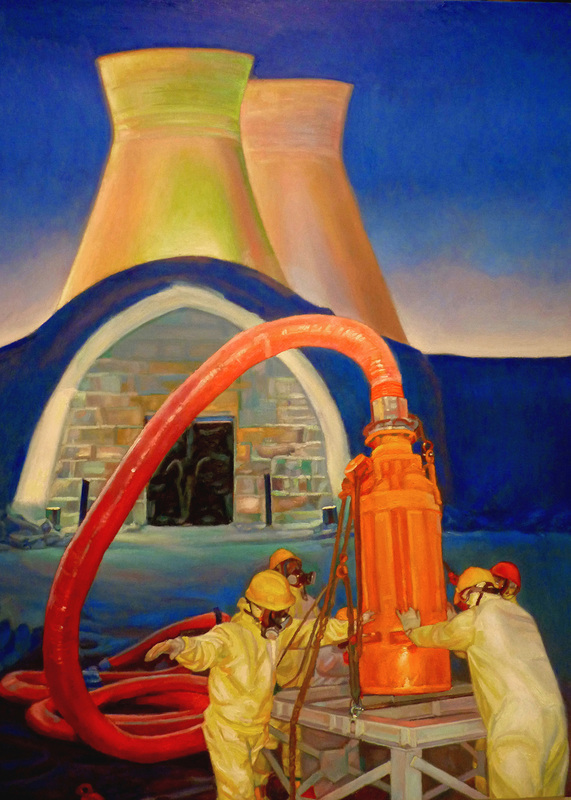 He created hugely multi-layered paintings bursting with incident, including floods and nuclear explosions which continued with the theme of death. Most recently Shoa made another dramatic move – from a tangible kind of reality to something quite intangible – where, contrary to all previous methods of working, accident was allowed to prompt imagination. In 2004 Shoa had his two large-scale, solo museum and art gallery painting exhibitions, Youth Culture, in Plymouth City Art Gallery and Museum and Giant Heads Multi-Culture, at the Hartlepool City Art Gallery. In 2005 he had another one-man exhibition, We Are Here, at The Herbert, Coventry City Art Gallery. In 2006 he exhibited twenty-eight Giant Heads in Bury City Art Gallery In an Exhibition called Facing Yourself. In 2007 he was in a group exhibition, True To Life at the Herbert, Coventry, where he exhibited his work alongside, Freud, Auerbach, Bomberg and Lenkiewicz. In 2010 he was in a group exhibition called, ' With Thy Face I See', at the Hartlepool City Art Gallery. In 2017 two of his paintings of Black Britishers are on show at the Herbert Coventry, Face to Face. His Skull paintings, Floods, Disasters and Nuclear explore death, life and transformation.